This work, for the very first time, and using some archives never before properly examined, explores the church’s response to the changing circumstances, at a high political and ecclesiastical level. 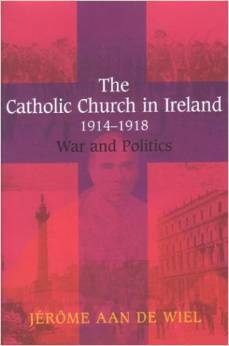 Almost nothing of any value has been written about the Catholic church during the First World War, and yet as the church of the great majority of Irish people it occupied a central position at a time of considerable social and political turmoil. This work, for the very first time, and using some archives never before properly examined, explores the church’s response to the changing circumstances, at a high political and ecclesiastical level. It reassesses some of the leading ecclesiastical figures of the time, such as Cardinal Logue, Archbishop Walsh and Bishop O’Dwyer of Limerick, and discusses the political interest of belligerent foreign powers in Ireland and its church. Dr Jérome aan de Wiel is both French and Dutsch. He obtained a PhD in Caen (France) in 1998. Since 2006, he has been Visiting professor at the History Department of University College Cork. He has been employed full-time as a main researcher/writer for a project subsidised by the Irish Research Council for the Humanities and the Social Sciences. This project is entitled The history of Ireland’s European integration, 1945-1973.